With all the 2012 end-time talk, the word "Mayan" comes up a lot. Just who were the Mayans? 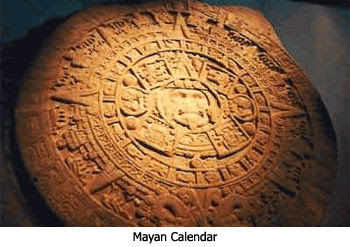 The Mayans saw all of time really in five ages with four of them according to their methodology having already passed. The last age started on August 11, 3114 B.C. and it is going to end on December 21, 2012. Now, some say these other four ages all ended in some great cataclysm, although there is a lot of speculation about that. The problem with that is most of this supposedly occurred before recorded history. And, so, we really don't know. Even the Mayan descendants that live down there today say that 2012 is not going to be the end of the world and that is not what they intended at all. Some say 2012 is going to be the end of the world on December 21st. Some say it is going to be a new beginning — a great global transformation of human consciousness — that is going to take place. One thing fascinating to me about the Mayan's is that without computers or telescopes they knew that the Earth turns on its axis, wobbling one degree every 72 years. To complete one of these cycles — called the Precession of the Equinox — takes almost 26,000 years. That precession will be completed on December 21st of 2012. 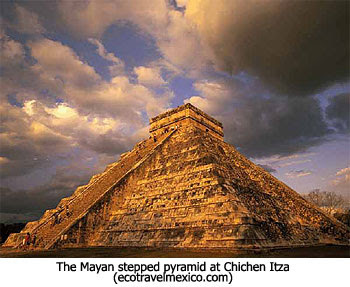 The Mayans knew an incredible amount about time and they knew an incredible amount about the universe. The inventions they had and the exactness of their calendars were simply amazing. I always tell people if it depended on me we wouldn't have the wheel yet. I just look at these people and the incredibly advanced civilization they had and am just amazed. 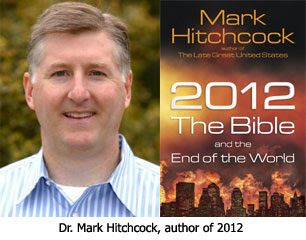 Week of Jan. 24 for three weeks - 2012, Cashless, and U.S. in Bible prophecy. I have never seen the movie you speak of, but yeah... that's pretty much what I would call it... A monkey face!